Amazingly, the only years with greater income inequality than 2012 were the two years before the Great Recession and the year before the Great Depression. The rich are different from you and me. They got a real recovery. Or one at all. According to the latest figures from economist Emmanuel Saez, the top 1 percent received 95 percent of all real income gains between 2009 and 2012. In 2011, when real real income fell for the bottom 99 percent, the top percentile accounted for 121 percent of the year's income gains. In 2012, inflation-adjusted incomes rose for the rest of us, but only barely. Meanwhile, the richest percentile got a 19 percent raise. They now account for 22.5 percent of total U.S. income. That's the fourth-highest share in at least 100 years (as far back as Saez keeps track). The only years with greater income inequality were the two years before the Great Recession, 2006 and 2007, and the year before the Great Depression, 1928. 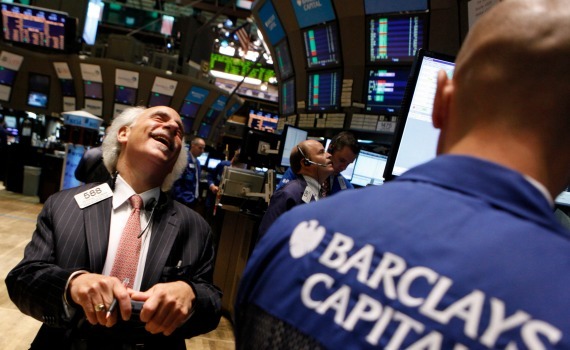 Why was 2012 such a boom year for the top 1 percent? Stocks, taxes, and ... something else. See, the story of the rise and rise of the super-rich the past 30 years has been the story of the return of the rentiers. 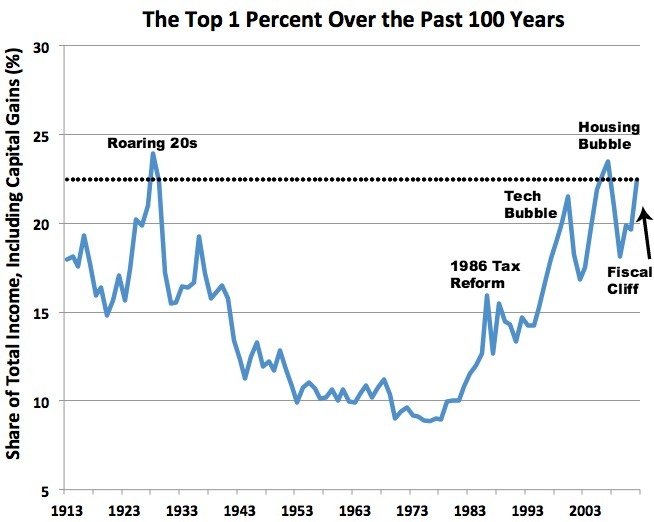 The Reagan revolution freed the top 1 percent, and particularly the top 0.1 percent, to once again tie themselves to deregulated, and buoyant (if not frothy), markets. And they have. Their incomes have recently tracked the S&P 500 pretty well -- and 2012 was a good year for the stock index, as it finished up more than 11.6 percent. But the tax hikes from the fiscal cliff and Obamacare made the rich more likely to cash in their capital gains now rather than later. After all, you decide when to sell your stocks, and companies decide when to pay out dividends -- and both will do so today if they think taxes will go up tomorrow. As you can see above, that's what happened in 1986, before tax reform raised capital gains rates to 28 percent, and it's what happened in 2012 when the end of the high-end Bush tax cuts and the Obamacare surtax sent capital gains rates from 15 to 23.8 percent for households making $250,000 or more. In other words, the top 1 percent won't be partying like it's 2012 in 2013, because part of the party was a one-time tax arbitrage. But there's something else happening too. As Saez points out, the top 1 percent's income share jumped quite a bit in 2012 even excluding capital gains. Why isn't entirely clear. But what is clear is that the Great Recession didn't cool inequality for long like the Great Depression did. Sure, the top 1 percent's income share will probably dip a bit this year after they brought so much income forward last year to avoid higher capital gains taxes, but there's plenty of reasons to expect it to keep marching up after that. About the only reason not to is that higher bank capital ratios should rein in Wall Street pay. Until then, it's the 1 percent's economy, and we're just living in it.